Heather Fenyk, PhD, AICP/PP holds a doctorate in Planning and Public Policy and a Masters in City and Regional Planning, both from Rutgers University. She combines research and advocacy in community organizing and academic work. With her husband Alex Zakrewsky, she founded Global Metrics, LLC, an urban planning research and consulting firm based in New Brunswick, NJ. Global Metrics has developed “Map Our Borders,” an interactive tool to demonstrate the capacity of crowdsoucing and GIS to democratize the delineation of political boundaries. Heather believes that the most enduring solutions to difficult societal problems are best addressed through community engagement and collaboration of diverse partners. Alex Zakrewsky works as a Principal Planner at the Middlesex County, NJ Office of Planning and is currently facilitating development of a new Middlesex County New Jersey Master Plan. He is also a co-founder of Middlesex Apartments, LLC. With his wife Heather Fenyk, Alex co-wrote and co-directed “Lydia’s Story,” a 2014 New Jersey Film Festival Official Selection about the Nazi invasion in Belarus and the post-WWII American immigration experience. Alex knows the Lower Raritan Watershed well, having grown up in Milltown, New Jersey, and graduated from Spotswood High School. He holds an MS in Urban Planning from Rutgers University; an MA in Sociology from The American University; and a BA in Political Science and Geography from The George Washington University. Amy Braunstein, Esq. is a Rutgers New Brunswick and Rutgers Law School alumna. She is the founder of Friends of Mile Run Brook. Friends of Mile Run Brook is an organization dedicated to raising awareness about this small tributary of the Raritan which serves as the boundary between the City of New Brunswick & Franklin Township. 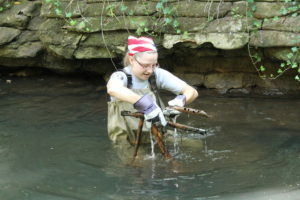 The group organizes stream cleanups and conducts stream monitoring with the LRWP. Read more about Amy and her work. David Tulloch, PhD is Associate Professor in Landscape Architecture and the Associate Director of the Center for Remote Sensing and Spatial Analysis in the School of Environmental and Biological Sciences at Rutgers, The State University of New Jersey. He holds a B.S.L.A. from Kentucky, M.L.A. from LSU and a PhD in Land Resources from Wisconsin-Madison. 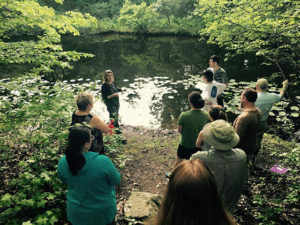 David is an avid urban explorer, and leads the LRWP’s walks in the watershed series: “Watershed Highlights and Hidden Streams: Walking Tours of the Lower Raritan Watershed.” Read more about David and his vision for the watershed and the LRWP. Missy Holzer, Ph.D. is is a veteran high school teacher of Earth & Space Science, Physical Geography, and AP Environmental Science in Chatham, NJ. Missy holds a Bachelors of Science in Environmental Planning and Design from Cook College, Rutgers University a Masters of Arts in Teaching Science from The College of New Jersey, a Masters of Science in Geography from Rutgers University and a PhD in Science Education from Rutgers Graduate School of Education. In addition to her high school teaching, Missy is involved in offering professional development to educators in local, state, national, and international venues. She uses her professional development offerings as a chance to inspire educators and encourage them to branch out to find new ways of engaging their students in order to prepare them to be effective citizens who make informed decisions, and to explore their natural world. Johnny J. Quispe is a doctoral candidate in the Rutgers Graduate Program in Ecology and Evolution in the School of Graduate Studies. Johnny has been investigating the effects of sea-level rise on coastal wetlands and the vulnerabilities of coastal areas prone to flooding, identifying areas for restoration and flooding mitigation, and quantifying damage from future flooding. He aims to connect and reconnect communities with their shorelines while learning from locals about their coasts’ past; especially in low-income inner cities where communities might not have access to waterfronts and do not have the opportunity to interact with the surrounding waterways. Johnny is expanding his research into disadvantaged coastal communities by working to preserve cultural identity, fostering sustainable relationships, and inspiring minorities to pursue science careers. 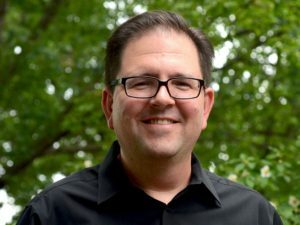 His previous work experience encompassed conservation, restoration, and environmental remediation projects in New Jersey in the nonprofit, public, and academic sectors. Johnny earned a Bachelor of Science in international environmental policy, institutions, and behaviors at Rutgers University. Doriann Kerber is a local entrepreneur and public servant. She has a Bachelors of Science, Business/Management Science from Kean University. She serves as Councilwoman for the Borough of Milltown, NJ, and as Treasurer for the Middlesex County Water Resources Association. Doriann has facilitated multiple rain garden builds at local schools, and is developing a municipal Green Infrastructure Master Plan for the Borough of Milltown.